The places you learn to love a country vary. In the 1990s, jingoism wasn’t overtly present. It was post Cold War, pre War Against Terror, and the Gulf War did not elicit the same “for the love of the country” emotions. Growing up just a wee bit media obsessed (and without cable television), I learned how to grapple with America not only in the classroom but also on the television screen. 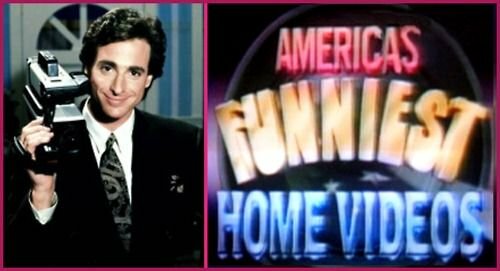 My weekly dose of patriotism came via reality show forerunners like American Gladiators and the very democratic America’s Funniest Home Videos. Every Sunday night, I sat and enjoyed the missteps, falls, and pies in the face suffered by my fellow compatriots. A vote was taken to determine the winner. Participating in this display of the country’s best meant embracing embarrassment, laughing, and making a choice. I loved it. America, this is you. For every moment that should make a proud American, the reasons for embarrassment lurks in the background. The most obvious moment is the nation’s creation. It is old hat now to note that this bastion of freedom and liberty was created with slavery very much in the foreground. At every defining juncture in the nation’s history, injustice and hypocrisy are lurking. It is a constant reminder to the world, that it is not what you say that matters, it's what you do. America ain’t really ‘bout this life. Yet to express awareness of these faults is to invite criticism and derision. There’s a nagging sense that any pride in America should be expressed without qualification, reasoning, or common sense. But still, those with doubts continue to relentlessly press for answers. Clap for 'em. Those who are told their lives matter the least in America, remain tethered to a hope that things must, can, and will change. Without some faith in the ability to change, there is little more that can maintain a love for this nation. It is the continued efforts of people like this, fueled by a cause, that has allowed the country to progress even this far. Historically it has been so, and today it remains the same. Sadly, our freedom fighters often fall short in their efforts to persuade others of the need for change. The arguments are sound. The moral, economic, and social benefits that equality would bring are all evident. But those who are comfortable fail to see the need to change the status quo. The resistance to change is nothing new. In any revolution, there will be Tories- those loyal to the life they know. To be a true patriot, it is not enough to embrace the laughing stock of failures that exist. It is necessary to push against it, and make changes that create a better future, with justice for all. If time will truly make more converts, as Thomas Paine suggested in his 1776 pamphlet, "Common Sense," then we also wait for it. Changes that matter can happen on the inside. Some places where the nation's voters await revolution include: the criminal justice system; the healthcare system, our education system; housing systems; etc. In 1852, the abololtionist Frederick Douglass urged the nation to make the changes that matter in his oft-quoted speech, “What to the Slave is the Fourth of July.” Key to his argument was the fact that the nation was young, and in it’s youth could easily make the necessary changes. America’s lingering between petulant child and prime teenager. The time for change is now. America is still embracing embarrassment. America still votes for their embarrassment. The pratfalls are not just on network tv on Sunday nights, but are on highlight reels around the world. Take note who is laughing now.